Google just added a load of new features to Google+ that should make it more fun to look at on your phone and more useful for your life. If you use Android, you'll start reaping the benefits immediately. First of all, images. If you use Google's instant upload feature on Android, Google will now let you store up to 5GB of full-size photos for free. This storage adds to the unlimited uploads for 2084-pixel photos. The mobile news stream now also supports animated GIFs, which is important because we live in a GIF world. Google has also added mobile support for the 360-degree photo spheres you can make using Android 4.2. 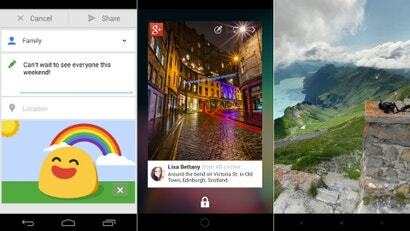 Also for Android 4.2, Google Now will start sending you birthday notifications for the people in your Google+ circles. Too bad only the Nexus 4 has 4.2 right now. Finally, Google Hangouts will now work at much lower bandwidth. You'll only need about 150 KB to get face to face with someone.